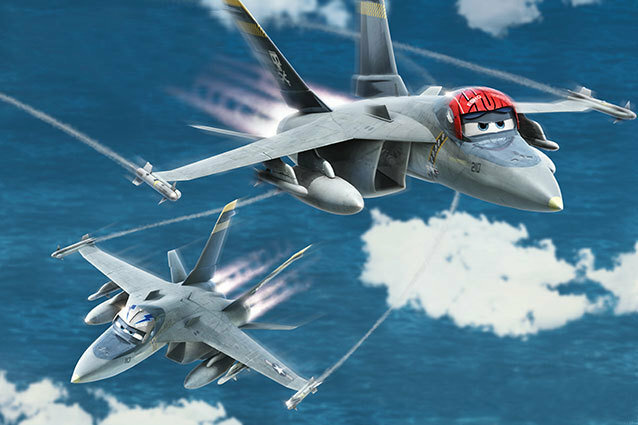 Disney’s new animated film, Planes, about — guess what! — planes, just got a turbocharged assist. Top Gun stars Val Kilmer and Anthony Edwards, who played ace pilots Iceman and Goose in Tony Scott‘s full-throttle 1986 actioner, are voicing anthropomorphic aircraft in the movie, out August 9. This is the best news we’ve heard about Planes so far, which otherwise has come across like the Theodore Tugboat to Cars‘ Thomas the Tank Engine. Now, of course, Kilmer and Edwards’ animated planes can’t be named Iceman and Goose — damn you, Paramount — so they’re going by Bravo and Echo instead. That doesn’t mean there isn’t a similarity to their characters in Top Gun, though. Check out this compelling visual evidence. Edwards’ Goose wore a red helmet in Top Gun. His Planes alter ego also wears a red helmet! Kilmer’s Iceman wore a blue helmet in Top Gun. His Planes alter ego also wears a blue helmet! We told you this visual evidence would be compelling. Does this make you more likely to go see the movie? And, seriously, they couldn’t get a Tom Cruise to voice a cocksure F-14 TomKat? I mean, an F-14 Tomcat?